Twenty-four years ago this month, a near-disaster kept one of the iconic artworks at SAM from swinging into motion. 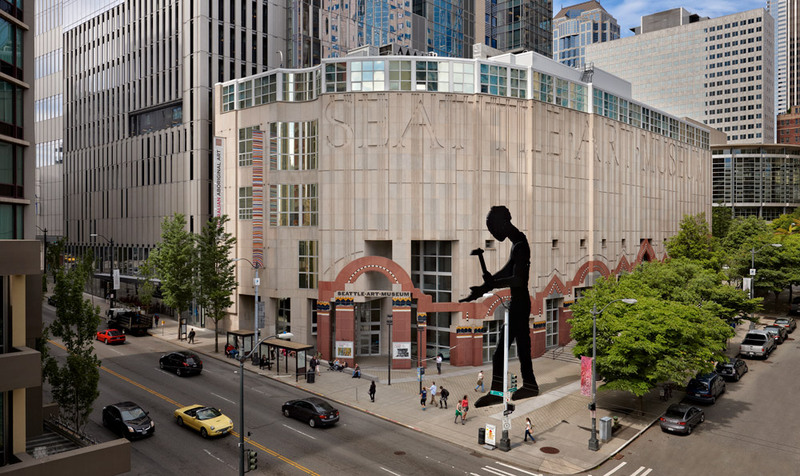 Johnathan Borofsky’s Hammering Man—a monumental moving sculpture owned by the City of Seattle and situated just outside SAM on 1st Avenue and University—honors the women and men of the working classes in impressive style. Measuring 48 feet tall and weighing in at approximately 22,000 pounds, he needs a long, powerful swing to bring down his hammer, which he manages at a clip of two and a half times per minute. His massive size caused serious issues for the team that took on the tall task of installing him on September 28, 1991. On that unlucky day, a lift-strap supporting the sculpture snapped, causing it to fall roughly one foot. Photographer John Stamets captured the carnage from across 1st Ave., atop the roof of the notorious Lusty Lady exotic dance parlor. The damage was significant enough that the sculpture had to be sent back cross-country to the foundry in Connecticut where it had been produced. Seattleites were left to wait another year to see Hammering Man installed again, which happened successfully in September of 1992. Opportunistic vendors turned out for that second installation, selling postcards with Stamets’ crash photography at $2.50 a piece. The multiple efforts and the wait were well worth it. Today, Hammering Man remains one of Seattle’s most popular artworks and public monuments. As a silhouette, the figure is anonymous, lacking any particular features that might help us to identify him. This allows him to serve as a global symbol—a champion of all working classes and a celebration of their accomplishments. We hope you’ll visit SAM to see this monument to the worker on Labor Day! As a bonus, you can look forward to the last day of our critically acclaimed Disguise: Masks & Global African Art exhibition, a multi-sensory experience featuring art by contemporary artists of African origin or descent. Cheers!